If you’re a runner and you’ve got knee pain or if you have chronic knees problems, read this article to learn how to heal your knees faster and prevent injuries with Chinese Reflexology. 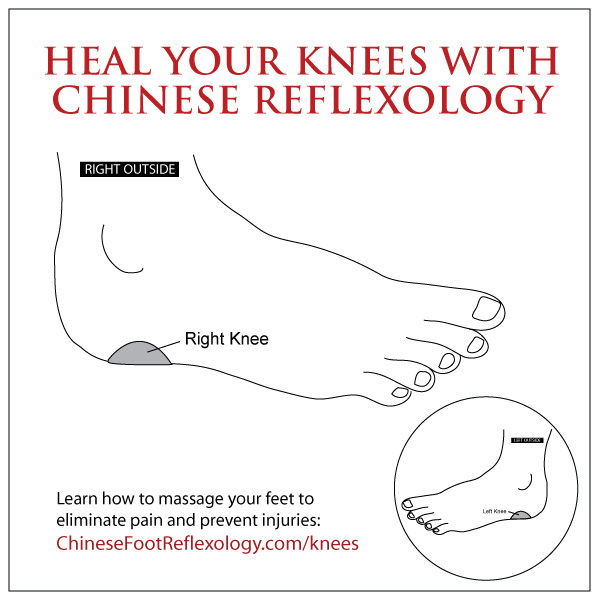 The Chinese Reflexology point for the knee helps to heal injuries faster and banish weird twinges and wobbles. It’s also very beneficial for long-term chronic weakness in the knees. The night before my race, for no apparent reason, I experienced a weird “twinge” in my knee. I was a little concerned so I took out my reflexology stick and used it to massage the reflexology point for my knees. After the massage, my knees felt fine and I went on to have a great run. In fact, I had such a fun race that I signed up for another triathlon. Although now I had a new goal: I wanted to be competitive. I began training for speed and I joined a running club for moms. We have a Facebook group where members post about training runs, races and accomplishing goals. Go ladies! However, there were also a few of women who posted about injuries, with knee injuries being the most common. In a perfect world, no one should ever have to use the phrase, “bone against bone” to describe their knees, yet that’s what some of these brave athletes were posting. 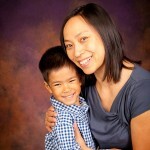 And as a fellow mom, I know that moms can’t afford to be sidelined because we’re so busy running after our kids! That’s why I’m dedicating this article to my running group and to all the runners and athletes out there. You know who you are. I know that it feels good to run and it feels amazing to challenge yourself and surpass your goals. However, it feels even better to run without pain, so if you’re experiencing knee pain, put up your feet and learn how to heal your knees faster with Chinese Reflexology. One of the core principles of Chinese Medicine is the concept of Qi or life force energy. Similar to how your body has a network of vessels for transporting blood, there’s also a network of channels for the flow of energy in your body. When Qi (energy), blood and fluids aren’t flowing as they should, this can lead to pain. Generally speaking, in Chinese Medicine, there are two main causes of knee problems. The first occurs when Qi is blocked and/or stagnant. It’s like the energy is pooling in the knees and there’s too much going on there. This describes a typical knee injury where there’s swelling and throbbing and usually the pain is quite intense. The second cause of knee problems is not having enough Qi, blood and fluids flowing through the knees. This is usually related to aging or insufficient nutrition and it tends to manifest more as a weakness of the knees. In both cases, knee pain is a result of a disruption in the normal flow of Qi, blood and fluids through the knees. While it’s easy to point a finger at an injury or over-training as the cause of knee pain, there’s usually an underlying condition that makes one more susceptible to wear and tear. The challenge is to figure out what the underlying condition is and to fix it—and of course, in the case of a running injury, you’ve got to fix bad running form too. With Chinese Reflexology, your feet tell you where there are Qi disruptions in your body. That’s because your feet house the “master control points” for regulating the flow of energy in your body. When you massage your reflexology points, you stimulate the proper flow of energy in your body. And when energy flows as it should, blood and fluids also flow properly and this supports your body’s natural healing process so that you can feel better faster. 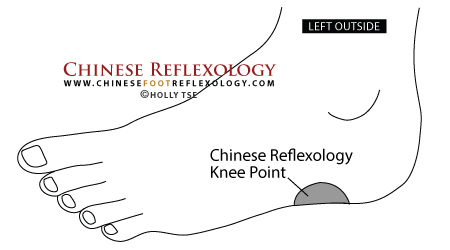 The Chinese Reflexology point for the knee is located on the outer edge of your foot where the skin meets the sole. It’s like a circle with a diameter slightly wider than the width of your thumb. To locate this point, use your thumb to feel along the edge of your foot in the area in front of your ankle. If your knees are sore, you’ll know you’ve found the knee reflexology point when you feel a tender spot. BINGO! Reflexology points are only sensitive when there’s an energy disharmony in the corresponding area of the body, such as one caused by a knee injury. You can measure your healing progress based on the sensitivity of the point. As you heal, the point will feel less sore. The point on your right foot corresponds to your right knee and the point on your left foot is for your left knee. You can use either your thumb or the knuckle of your index finger to massage the knee reflexology point. Press and rub the area using a back and forth motion, from toe to heel and back again. If you have an acute knee injury, massage the knee reflexology point for 60 seconds, 3 times a day. Do this until the acute phase of the injury passes. Then, you can gradually reduce the amount of massage until your knees are healed. E.g. 60 seconds twice a day reducing down to 30 seconds at a time. If you’re massaging for chronic knee pain, you will need to massage the reflexology point for your knee for a longer time frame. Things that are chronic have been ongoing for a much longer time. Thus, it takes your body more time to rebalance itself, but you should notice that the reflexology point is less sensitive after about 2 to 3 weeks. That’s a good sign. It means the Qi is starting to flow as it should and your physical body will begin reflecting this soon. When you’re feeling better and not in the deep fear or frustration that an injury can bring on, it’s time to delve deeper. One thing to note too is that when you’re feeling better, that doesn’t mean you should then run out and push yourself harder. Knee injuries don’t suddenly appear, especially if you’re a runner. They take time to develop and there’s always an underlying cause that goes even deeper than the physical body. This is where stuff gets interesting and in my opinion, where things get quite fun! I’m talking about the emotional, spiritual and mental causes of injury. “Water in the knee indicates a holding of emotional energy, particularly a resistance to surrender, or there may be too much emotion to cope with and the weight is being carried in the knees. An inflamed knee indicates something or someone is making you feel irritated or angry, and you will not give in! I love this wonderfully written article from Monika Meulman at The Healing Muse about what she learned from her knee pain while she was a running coach. Holly Tse, author of ChineseFootReflexology.com (Heh, heh, did I catch you by surprise here? ), believes that the knees are related to moving forwards in life. Your feet, ankles, knees and legs are all related to movement. When you resist the flow of life and try to control it, that’s when knee issues arise. Your body is simply trying to tell you something that your bullheaded mind is too stubborn to hear. Injuries are a very effective way for your body to draw attention to an area of your life that you’ve been overlooking. Injuries shine a spotlight on something that you’ve been ignoring or setting aside for quite some time. More often than not, what you’ve been ignoring is yourself. What you crave is appreciation and nurturing and it’s not so much from other people, it’s from yourself. This is especially true for people who are always giving to others, such as moms. When you get injured, it gives you a reason to pause and stop giving to everyone else. It gives you an opportunity to have others support you, but most importantly, it gives you the opportunity to give to yourself. In my twenties, I never said, “No” to people. I always did what I thought other people expected of me and I completely ignored my own needs. When I got into a car accident, it was the first time in my life I felt I had a good enough excuse to start saying, “No,” to everyone else’s demands and start saying, “Yes,” to myself. When I felt that twinge in my knee the night before my triathlon, I stopped what I was doing to focus on nurturing myself by massaging my knee reflexology point. I also said, “Screw this” to worrying about swimming in the Bay or how many pounds away I was from my pre-pregnancy weight. I decided to simply allow myself to enjoy the experience of the race and sure enough, the knee pain went away. So if you’ve got knee pain, the best gift you can give yourself is to let go of managing everyone and everything around you. Give yourself the compassion and nurturing that your body is craving and of course, take the time to massage your knee reflexology points too! Rest. Be well. Heal your knees and move freely through life. Know a Runner or Someone With Knee Problems? Help ’em keep their knees healthy by sharing this article on Facebook or Pinterest. To share, please click one of the buttons at the bottom of this page. Thank you. Their knees will thank you too! Did You Know There Are Chinese Reflexology Points to Strengthen Muscles and Relax Tendons? In Traditional Chinese Medicine, the Spleen supports strong and healthy muscles through its role in digesting food and transporting nutrients throughout the body. The Liver channel also plays a key role in nourishing the tendons. There are Chinese Reflexology points for both of these organs/meridians. You can locate these points by downloading your free Chinese Reflexology foot charts. Once you do, press these points on your feet to see if they’re sensitive. This will give you an indication of what is going on in your body at the energy level. Simply sign up below for my newsletter, Amazing Feet. You’ll get free online lessons as well as the reflexology charts.